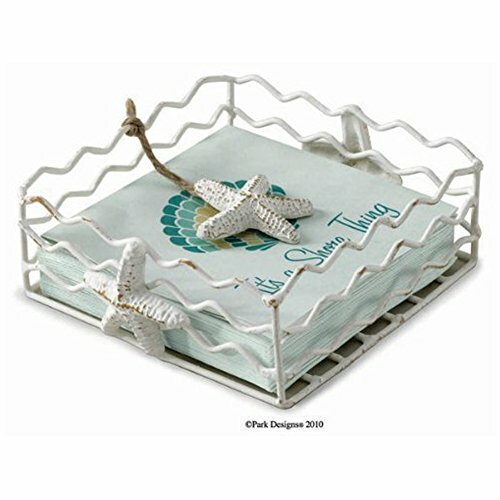 Stylish starfish giftware features cast aluminum shell motifs with white over tan finish. A starfish shaped paperweight is attached to keep your napkins from blowing away. Measures approximately 5 1/2 inches x 5 1/2 inches x 2 inches high. Holds beverage size napkins (not included). Stylish starfish beverage napkin holder by Park Designs. Made of Cast Aluminum w/ a distressed white over tan finish. Features a starfish shaped paperweight to keep napkins secure. Measures approximately 5 1/2 inches x 5 1/2 inches x 2 inches high. Holds beverage size napkins (not included).